Since we decided to really dig in and improve our current homestead, we've been thinking about the new additions we'd like to make in the garden and also in the barnyard. I have always had a soft spot in my heart for goats and think that tiny baby goat kids are just the cutest things ever. I imagined we would keep goats at some point, but sort of pushed it off into the future. We recently decided why wait? If we want goats, we should get some goats. But we honestly don't know much at all about them, so we searched online for a local goat farm to visit for hands on experience. Our search led us to Itty Bitty Critter Farm which is about a 2 hour drive away. We called the owners and they invited us to visit the farm over the weekend and ask as many questions as we wanted. We ended up spending a bit of time with the owners and the goats this past Saturday and had a blast! I haven't been around goats at all before, so I was surprised at how friendly and calm they were. I had heard that goats will jump on you and try to eat your clothing, but these girls and boys were so polite and well behaved. I found that they liked to be petted and scratched on the head, so I happily obliged. David spent a lot of time asking about the proper housing and fencing for the goats. I tried to stay focused and learn as much as possible, but I have to admit, I spent most of my time taking photos and observing (and petting) the sweet girls and boys. There is one mama to be who is due sometime around March. Her babies are not yet spoken for, so depending on how things work out, we may be able to get some goats this summer. We've decided on Nigerian Dwarf goats because they are smaller and easier to manage than other standard sized breeds (and also because they are just so adorable). Eventually we'd like to milk them, so we are thinking about getting a couple girls. We still have some planning and deciding to do, but we are going to make our dream of having goats a reality! If you are in the St. Louis area and interested in goats, we highly recommend Itty Bitty Critter Farm. The owners are very knowledgeable and willing to answer any questions you may have. They take such good care of their goats and you can tell the girls and boys are well loved and spoiled. Many thanks to Sandra and Gary for being such great hosts and educators. If you take a visit there, let them know we sent you! I'm pretty sure you're going to be the best goat owners evah!! And those are some pretty ones you've gotten pictures of, they're eyes are super clear and really pretty!! Tammy, how cool! Great news They are adorable goats. I would like to have pet goats and hubby would not have to cute the grass. What a fun visit to the goat farm. I would be hugging and taking photos too. Thanks for sharing, have a happy week ahead! Wonderful idea to visit a farm and try them up close. I'd like goats one day - imagine all that delicious cheese just waiting to be made!! They are wonderful ! I'm surprised but they have beautiful eyes. I've seen these first-hand; they'll make you want to install a roof like this as soon as possible. I think goats are a great idea, as long as they have a proper roof to go with them. You might also unintentionally attract hobbits, so be careful: hobbits eat much more than goats! Oooooh, I love goats! They're great "lawnmowers" too! I'm so excited for you guys... I can't wait to meet the goats you end up picking! My sister has two goats. We love to visit them. They make good guard animals for her. As soon as a stranger comes into the yard they let her know. I would love to have goats one day too. I hope you get some this summer. There are goats at many of the petting zoos around here and they are very friendly with the kids (the human kind of kids that is haha). how adorable they are! I'm anxious to see you get them and share them on the blog. Yay! So exciting Tammy! I LOVE goats and grew up with two of my own (Riff and Raff). I have wonderful memories of my sweet little friends - and we did eventually have to give them away because they were jumping their fence (and roaming the town and causing all sorts of mischief) BUT they were wonderful! I know they will make wonderful additions to your home too! Love the pics! Can't wait to see your journey with the "kids". I love my goats and I'm sure you guys will love yours when you get them! How cool that the folks were so willing to answer questions so that there are no surprises when you finally get them home! P.S; You will love having your own milk and being able to make cheese! How exciting! It looks like you bonded with those sweet things. How wonderful that the goat farmers were so open. Can't wait to see you with your new goat babies! My sister started her own goat farm a few years ago and she had no clue what to expect. She started out with a couple of goats, learned what she needed to, and now has a whole pasture full of them. Just like most critters, they each have their own personality which always makes things fun and interesting. Hooray!!!!!!!!!!!!! :) I will live vicariously through you because that's the breed we were on our way to purchasing. They are so wonderful, aren't they? So happy you found a nice farm with people willing to share info with you. My fingers are crossed that goats are coming to you soon! I can't wait to see how your goats work out! I have been wanting to get some! This is wonderful Tammy and your pictures are so much fun. The dwarf goats would be perfect;)y friend Susan ( you've seen her on my blog has goats, chickens, a pony and a Great Dane.. Lots of work!! Her goats are so funny and have very distinct personalities. How adorable! What a great addition to your homestead this would be. Such cute animals! Who wouldn't want a goat or two? Oh I am so envious! We have thought about goats too! But with the hubbys hectic work schedule and travel its just not our time. Another great person to learn from is Debra at Antiquity Oaks. I have gone to a couple goat classes from her. She also just published a great book about goats. Good luck to you guys!! This is so interesting! I've been around very few goats in my life, so I don't know much about them. Their eyes are so pretty, is the color specific to this breed? I am really looking forward to following you on this journey! I am very excited for you both Tammy. I can't wait to follow this new chapter in your journey and to see the new additions when you get them!! The goats seem excited for getting themselves clicked! Oh my - those goats ARE adorable! Great pics as always! We had goats growing up and the 2 most vivid memories are of them constantly escaping, and taking 2 kids to our local church in a pet blessing. As the vicar put his hand on the baby goats head, the goat started eating his dangly sleeve. Hilarious! Great photos, good luck if you get some. This post reminds me of a man who lives in the city with his pet goats. He walks them at night on the streets as you would a dog. Quite the sight! 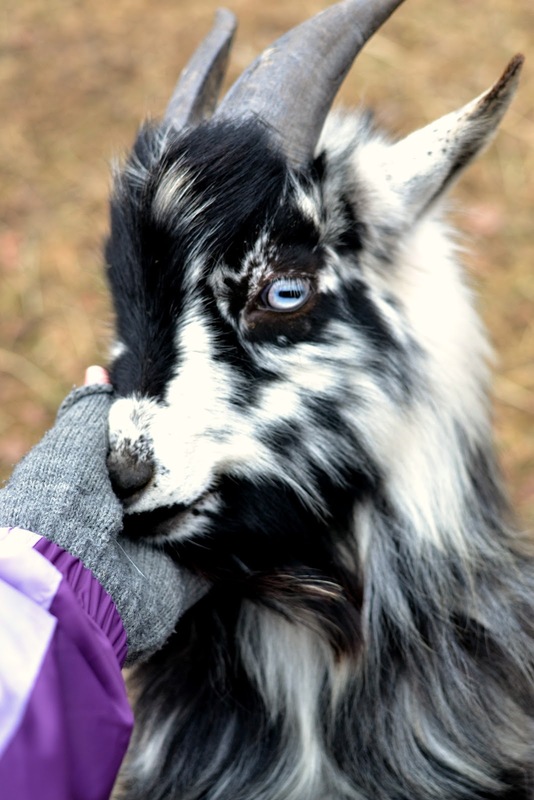 These dwarf goats are so cute and their sweet personality really does seem to shine through. I love having animals around. Those goats are pretty cute, I wouldn't mind having a couple some day! We are still searching for our perfect homestead, it's taking longer that I thought to find the right property, but hopefully we'll find something soon. Great photos!! oh they are so cute!! can't wait to start hearing about your goat adventures! Oh YES! You'll love goats. They love to play and cuddle - mine bring a smile to my face each and every day. Good luck! What I heard is that you may have a buck close by when your girls are ready to breed. :-) Good for you for 'digging in' and going for what you want. So exciting! We thought we would wait to get goats, but couldn't wait. Jumped right in and nevered looked back. We love having them around, and enjoy the milk very much. I'm glad you are going with the ND's. The milk is so creamy and you can so much with it. Check out nigeriandwarfdairygoat.ning. Alot of good info. So glad you shared this on The Maple Hill Hop today! They are the sweetest! What fun! My sil lives on 40 acres in central California and her next door neighbor has goats...and makes delicious cheese. I think they are so cute...what a great addition...can't wait to see what you get! Have a great day!! The closest we have been to a farm is when we go the petting zoo. They do look friendly. I think Madison would enjoy visiting a farm, there is so much I want to show her now that's she's young. She pointed at the goat and said "mooo" lol. Hope you're having a great week! Great therapy animals; but be careful, I've read they can jump.Congrats! You will enjoy raising goats, it's not hard at all and they are a lot of fun. I raised goats many years ago, they will be come your pets and follow you around wanting food all the time! They are really fun and they are good to eat too. THey are so cute! I really want goats some day. 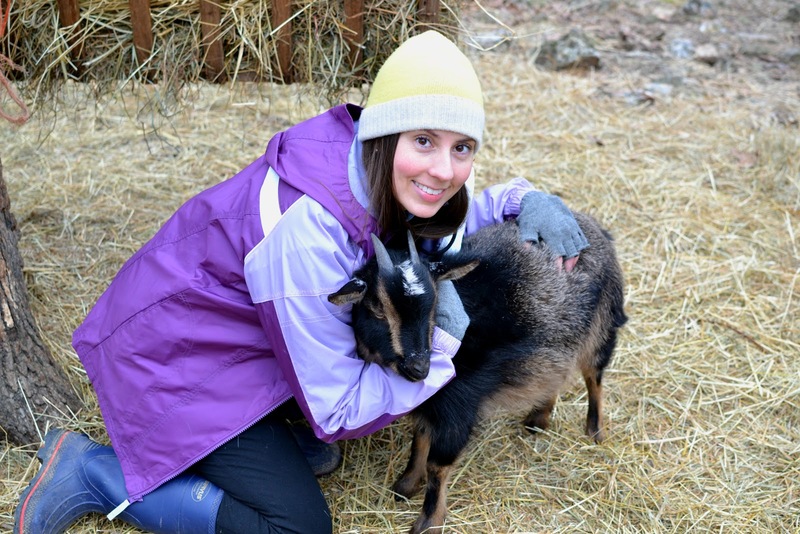 I have a blog friend in Canada with two goats. I love seeing the photos. All the best to you in your decision. Enlisting a fence transient worker is one of the maximum honest techniques to ensure you replicate the class of nature to your yard via building a sturdy wood fence tricolored with a decent fine sealant a good way to draw out the regular excellence of the wood. Timber is part that comes directly from nature discover here.